The small town of Vienna, VA is a place that is truly rich in history. In this article, we are going to first look at the first settlers in the area, the native Americans. Secondly, we will touch on the brief history before the Civil War, thidly, the town’s importance during the Civil War, and finally, post Civil War. Now is the time to take a dive among the history books, and see what Vienna, VA has to offer. Before the Anglo settlers made Vienna, VA home, the native Americans of the area called this area home. Although there was no permeant settlement in the area, the local native American groups often spent several months in and around present day Vienna, VA. With great access to the local waterway, and even better hunting and gathering, Vienna, VA was a great seasonal home for these men and woman. The first non-native settlement dates back to the 1740’s but the town was first settled in 1754 by Colonel Charles Broadwater. John Hunter, Col. Broadwater’s son-in-law built the first recorded house in 1767. He named it Ayr Hill, which was an ode to Ayr, Scotland, his birthplace. The area was known as Ayr Hill for almost a century until in 1850, the town was renamed to the current Vienna. This was completed as a condition on William Hendrick’s move to the area as the first doctor in the area. On June 17, 1861, one of the earliest armed clashes of the civil war happened in this small town, called the Battle of Vienna. 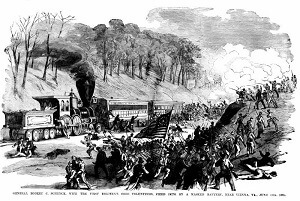 A would be Union occupation unit under Brigadier General Robert C. Schenck approached the town of Vienna from the east by train. Upon entering the outer city limits, the unit fell under attack by Colonel Maxcy Gregg. The Confederate Colonel forced the Union troops into retreat, which marked the end of one of the first armed conflicts of the war. In 1867, the old Union Army barracks lumber was obtained through the Freedmen’s Bureau by the Baptist Church and founded the first church in the area. The church was also home to the first black public school in the town. The first white public school was built a few years later in 1872. The area was fully desegregated by the Fall of 1965. Moving up a few decades, Vienna was in the news for a spy scandal! IN 2001, the FBI arrested Robert Hanssen for spying for Russian intelligence service, the former KGB. His home was outside the actual town, but he did hold a Vienna mailing address. He utilised dead drops in nearby Foxstone Park to deliver U.S. Government secrets to his handlers and would exchange cash or diamonds. He was sentenced to multiple life terms in prison and is still behind bars. Today Vienna, VA is a town that loves its history but is truly an amazing place to live. NO matter if you are looking to work or play, Vienna is the place to do it!